Just happened to stumble, (by way of this interesting essay) onto a piece that talks about the parallels between Intelligent Design in biology and socialism/communism in economics. Worthwhile reading. It's been a while since I posted anything here, mainly because my time has been occupied dealing with some broken plumbing in our house. We have low water pressure coming in from the main so the builder installed a Grundfos MQ booster pump. Alas, the MQ has a few quirks, not least of which is that it is not adjustable and produces about 95 PSI. So when you turn on a tap in our house it starts out as a trickle, and then transforms into a gushing torrent. The situation came to a head, so to speak, when a few weeks ago the plastic (!) fitting that attaches the outflow pipe to the pump failed, resulting in a rather spectacular geyser of water at the side of our house. I went through half a dozen different plumbers, plumbing supply shops, and don't even know how many web pages to try to figure out what to do about it. Everyone was telling me something different. Some said I needed a different kind of pump. 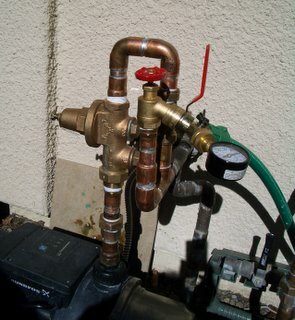 Others said, no, the MQ is top of the line, you need a pressure regulator. Still others said I don't need to do anything, 95 PSI is not too high. I finally decided to go with the pressure regulator since that seemed to be the least disruptive solution. Again I had the very devil of a time finding someone who would do the work for me. There must be an awful lot of demand for plumbing services in Southern California. I actually had one come out and spend an hour evaluating the situation and then never even got back to me with an estimate. Go figure. It looks quite good (if I do say so myself), and it doesn't leak (well, not much). But mainly the pressure in the house is now down to a more reasonable 65 PSI. It feels good to get something like that done. So Saddam didn't use chemical weapons during Desert Storm (because he didn't have any) but now it appears that we did. Not that this should come as too much of a surprise in the wake of Abu Ghraib and the ongoing opposition by the Bush Administration to the McCain amendment to outlaw torture. I'm not quite sure whether this is an indication of how badly screwed up the patent system is in this country, or a brilliant idea that I wish I had thought of. A method of doing business includes: ascertaining an invention record; identifying an inventor; estimating a cost to breaking the invention record; indicating to a sponsor that the inventor intends to invent sufficiently many inventions to break the invention record; providing evidence to the sponsor that the inventor is capable of inventing sufficiently many inventions to break the invention record; and inciting the sponsor to pay for at least a portion of the cost at least in part by offering to the sponsor at least one of: at least a portion of royalty rights relating to the inventions; and at least a portion of media rights relating to the inventor.